Young people seem to think it funny when they ask about a rule in one of my prototypes and I say "I don't remember". "But it's your game!" they say. Yes, but I have dozens of prototypes going, and I see no reason to remember all the rules--that's why I write them down. Further, if I rely on what's written, then I'll know that the way we're playing matches the way other people will ultimately be playing. I have to remember as much as I can about the games that only have notes, not full rules--I don't write full rules until the game has been played several times. And at my age I have a lot more to remember than 20-somethings do. So I save my memory for what's important! I am always a little fascinated by "designers" who say they're working on just one game. That certainly allows for full focus and full memorization of the rules, but given that the majority of games don't work out well, the more you work on, the more you're likely to have some that will "rise to the top". I try to approach it in a businesslike manner, the folks who design only one at a time certainly appear to be hobbyists only. I often attend the NC State Tabletop Gamers meetings, where everyone else is age 25 and under, making me incredibly old. Recently I asked the players what their favorite game is. With one exception (who heard my question and asked me to ask him), not a single one could name their favorite game. I've found this is often the case with game development students, too. As new games come out, they get interested in the new ones and lose much of their interest in the old ones. So they don't really have favorites. It's unusual for the same game to be played twice at the meetings (partly a matter of time), unusual for a person to play a particular game a second time in an evening. And most of the players are willing to "have a go" at games they have never heard of, let alone learned to play before the meeting. This only shows once again that there is a big difference between generations. I can name all my favorite games from the time I started playing strategy games: Conflict briefly, then Broadsides, and at age 12 Stalingrad (and others from AH, though SG was "the" favorite). Age 18 introduced me to Diplomacy. Age 24, D&D. I played D&D for 29 years, then took three years off, and got back into designing games. I'd have to say my favorite now is Britannia, though I've never played a published version, always preliminary versions or variants. My second favorites tended at one time to be video games, Empire Deluxe, Total Annihilation (played at SLOW speed! ), Civilization 2, and Heroes of Might and Magic 2. Lately I haven't had much time to play video games. My second favorite now would be D&D (after Brit). And like many people my age, I want to study the rules and the game before I play; I dislike being taught by another person how to play a game, because it's so likely that confusion will result. I suspect the "cult of the new" has something to do with these differences between me and the NC State gamers. Nowadays people, especially young people, assume that whatever is newest is usually best. Older generations (and perhaps anyone with a lot of experience) realizes that "new" is not necessarily a recommendation. Here's a question: if I have always had these favorite games, why do I design new ones? Some designers may design games so that they can enjoy playing them, but that's not my motivation. I design them first so that other people can enjoy playing them, and second as interesting intellectual exercises. 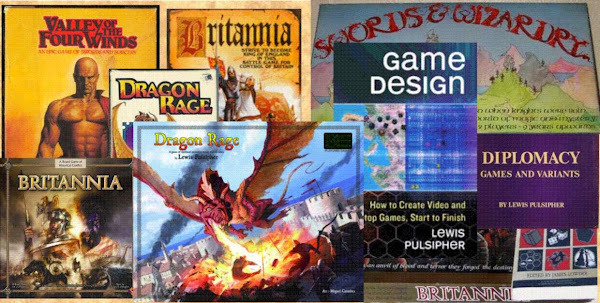 I came back into designing games after a 20 year hiatus because I realized that of all the things I had done, the one that provided the most pleasure and stimulus to the most people is Britannia. And I wanted to do more. But as I design a ridiculous number of games, I find I'm doing it to "solve a problem", sometimes a problem related to history, sometimes a problem I manufacture, that is, to meet self-imposed constraints. For example, Law & Chaos is likely to be a very popular game once published, probably more popular than Britannia ever was, yet it began as a simple desire to make a game that uses glass beads for its only pieces. I don't actually play the games, once published, so I clearly don't make them in order to play them myself. I don't even play them in playtest sessions, if there are enough other players, because I don't want to skew the results. Nonetheless, it's music to my ears to hear someone say "I love this game" or that they've played Britannia five hundred times (I sure haven't), or that Swords & Wizardry is their favorite boardgame. Having said that, there's rarely anything so fascinating as playing a game I've designed for the first time. How will it work out, what will I need to change, will there "be anything in it"? I have to confess that there are a few I've designed that I don't particularly enjoy playing, but other people do. That's partly a consequence of experience, partly of designing by constraints to see what I can work out. Game design is a vocation for me rather than a living, so I can do what I want, how I want it.